We headed out of Aberdeen east on US 12 to Millbank where we stopped for some lunch as some warm frontal showers passed overhead. 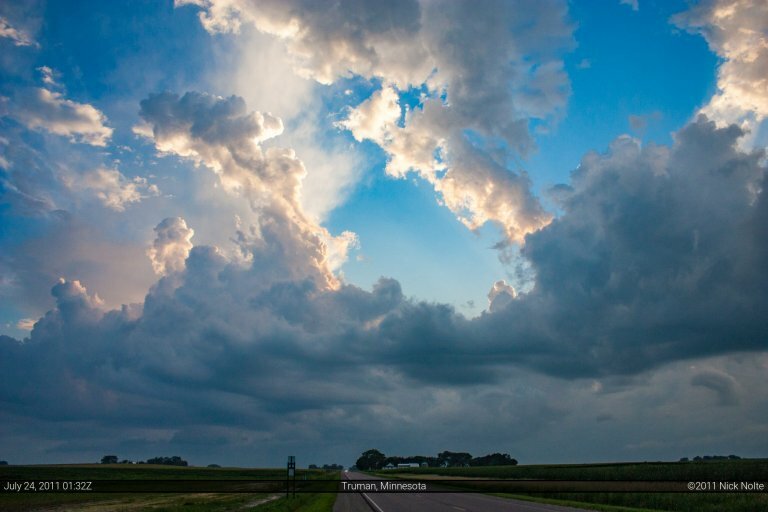 We continued on and hung out in Benson for a bit while some storms north of the front taunted us. We called them the bait storms expecting them to draw some people north causing them to miss the show later in the south. After a while in Benson we moved southeast on US 12 to Willmar and current data was leading us to head south from there towards Redwood Falls as we made a move to the clearing on satellite. While sitting here we kept an eye on RUC and HRRR and both kept saying that cells would begin firing in two hours. Unfortunately, this pattern remained for a few runs and storms were always two hours away. Around 0z we mentioned that if nothing happened in the next hour we would begin the trek home. Then, shortly after 0z a green blip showed up on base reflectivity to our southwest, just five miles from where we were sitting. We watched it for a scan or two and it grew in size and intensity, initiation had FINALLY started. Shortly after the video the storm kinda fizzled out, but the one to the northeast was getting it’s act together…so we went after that one. That would end up being the game for the rest of the evening, get on a storm as it fizzled and the next one up the line was strengthening. As darkness fell, stuff began to congeal and the chase was pretty much over. The drive home began as I made my way towards Madison.